One of the best ways to see the island of Kauai is by taking a sailing catamaran. On a recent boat cruise to the Na Pali Coast, I captured in photo these beautiful cliffs that Kauai is so known for and then painted it in my studio. Enjoy! 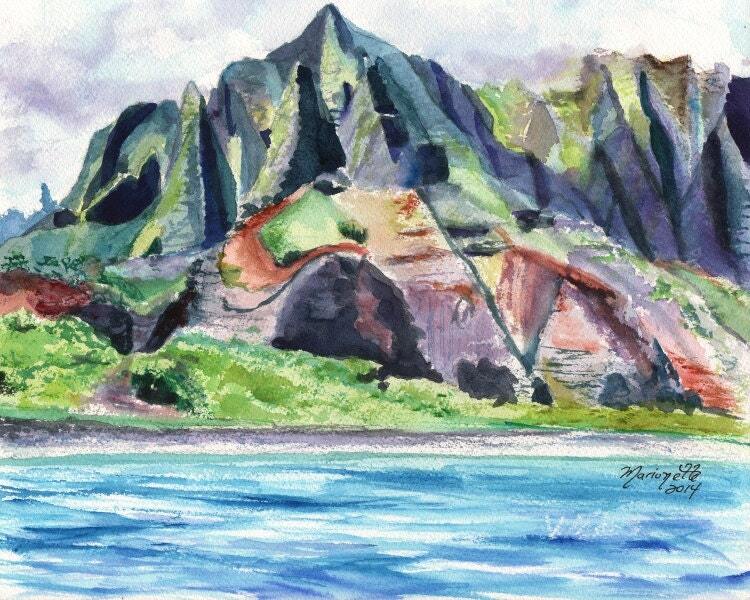 "Majestic Na Pali Coast" - This giclee print is signed by the artist and is printed with archival inks on radiant white watercolor paper. It is a reproduction of an original watercolor painting and comes packed in a clear sleeve with a backing board (unframed). Colors may vary slightly from monitor to monitor. Two more beautiful additions! I love the colors and detail! I can practically smell the ocean air. They arrived so carefully packaged and she was so quick to answer my questions. Will be back! Beautiful! Even more lovely in person! Wonderful to work with, will definitely purchase from again!